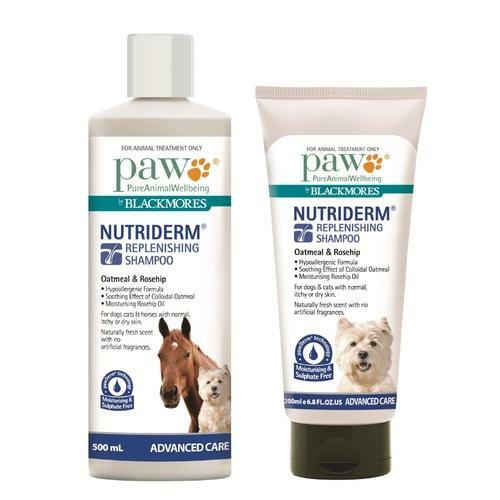 PAW NutriDerm"_ Replenishing Shampoo is an innovative, advanced way to wash and care for your dog"_s skin. A sulphate free, moisture rich, oatmeal pet shampoo it is suitable for dogs and cats with normal, dry and itchy skin. Hypoallergenic, sulphate free and soap free cleansers: for a gentle clean without stripping natural oils from the skin. Key moisturising nutrients: including rosehip oil and vitamin B5 to optimise skin hydration and maintain the skin barrier.